Apivita is a Greek brand known for their skincare but I never knew their range incorporated hair care. 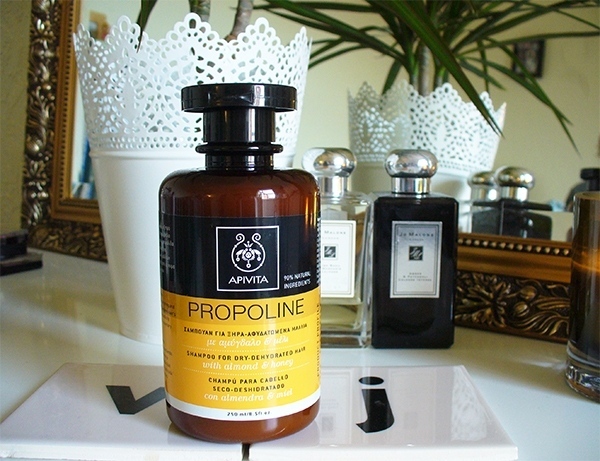 I have been testing out an Almond and Honey Shampoo from their Propoline range since Christmas. This shampoo is 90% natural and this formula is aimed at nourishing and hydrating dry – dehydrated hair. It contains honey, aloe vera, almond & olive oil and wheat protein it also contains Rosemary infusion to offer antioxidant, toning, antiseptic and anti-irritant action. These ingredients also give hydration, prevent split ends and shield against environmental damage. Since using this I have noticed my hair has a lovely glossy sheen to it and it feels soft to the touch. It is easy to wash out but does contain SLS so foams up to a lather, It has a sweet smell (which is very nice) and the formula is quite thin in consistency. The only gripe I have is the packaging it looks pretty but when you get down to the last few uses it is so hard to get out when you’re in the shower, hands are wet and you have to turn it upside down and hit it like a ketchup bottle. It’s a bit of a pain. If they added a pump the packaging would be perfect. The shampoo itself is good quality and I think it actually works, I haven’t noticed if it helps with split ends but it certainly hydrates and quite often I don’t use a conditioner when I use this as I feel like it gives my hair enough moisture that I can miss that step out (and that makes me quicker in the shower = more time in bed). This 250ml has only just ran out & it lasted me over 3 months using it at least twice a week. So that is pretty good in my book. Let me know if you have tried any Apivita shampoos, I have liked using this one & would recommend it to anyone that has dry, dehydrated or even dull hair.